For much of their 28-year marriage, Brian and Amy Miller of Ormond-by-the-Sea spent vacations camping in the Florida Keys with their two children. They considered buying a permanent camp site, but instead bought a dilapidated mobile home in February 2011 on Little Torch Key about 20 miles from Key West. Many family vacations were spent fixing up the 1971 single-wide mobile home and making it livable. Brian Miller is in construction and remodeling. Amy Miller is an elementary school teacher. Then, in early October, Brian Miller opened a letter from a Denver attorney and felt sick. The letter was a legal notice that bank creditors of the Keys property seller were trying to take the property after settling a federal bankruptcy case with the seller. It can happen because of a federal code that’s been in place since 1978. 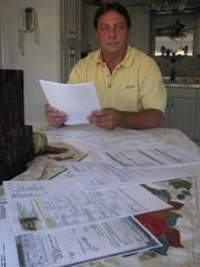 Brian Miller looks over the legal documents he hopes will save his family’s Keys vacation home. bankruptcy case can void the sale of property by a debtor made within two years of a bankruptcy filing if the debtor voluntarily or involuntarily made such a transfer with actual intent to hinder, delay or defraud any entity to which the seller is indebted. The code also allows the trustee to void the sale if the seller received less than a reasonable value. That second provision is probably why the trustee for the creditors is going after the Miller’s property, said David Walker, a Denver attorney the Millers hired to defend the lawsuit. “The creditors filed two days before the deadline so I’m thinking maybe they saw the location in the Keys, and we’re here in Denver, and figured it was worth a lot more than what the Miller’s paid,” Walker said. The Millers paid $75,000 in cash for the mobile home and property that had a tax assessed value of $98,000 in 2011. Its current tax assessed value is $103,000, according to Monroe County property records. Brian Miller says he’s spent more than $23,000 in renovations. The Millers never met the former owners, Brian Miller said. It wasn’t a short sale or a foreclosure. The Millers worked with a licensed real estate agent in the Keys, had an attorney at the closing and bought title insurance. But the Millers have to pay to defend the lawsuit. The couple have already paid a $5,000 retainer and face higher costs if the case goes to court. Under the code, a court-appointed trustee in a federal bankruptcy case can void the sale of property by a debtor made within two years of a bankruptcy filing if the debtor voluntarily or involuntarily made such a transfer with actual intent to hinder, delay or defraud any entity to which the seller is indebted. Miller, through Walker, has asked the bankruptcy court in Denver for an extension of the time they must respond to the lawsuit. Meanwhile, they have sent the trustee and his attorney a package of material and documents supporting the claim that Miller’s purchase was at a fair market value. They hope that convinces the trustee and creditors to drop the case. They are waiting for a response. If the Millers lose, the court could order the property back to the seller’s estate to be sold and the funds distributed to ceditors. In that case, the Millers could be paid the $70,000 they paid for the property, but lose the renovation costs, Walker said. Or, the court could order the Millers to pay the difference between the $70,000 and a value determined by the court.